As Europe grapples with Greece and the U.S. struggles to create jobs, Australia's economy is soaring, driving the Australian dollar to historic heights against the U.S. dollar  something unthinkable a decade ago when Sydney hosted the 2000 Olympics. But a strong Australian dollar has not been good for tourism. 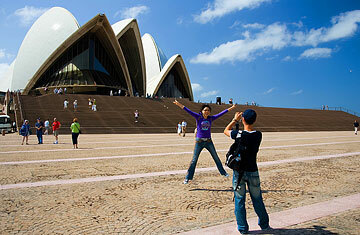 In the past 10 years, tourism revenue has shrunk from 3.4% of Australia's GDP to 2.6%. The number of people flocking to Australian shores has also dropped steadily since the Olympics; according to the most recent statistics available, international arrivals were down 2.5% in July 2011 from July 2010. Tourism officials realize they have a problem. In an effort to promote the country last year, a number of government and tourism bodies spent nearly $5 million to bring Oprah Down Under to tape her show. It didn't exactly work. Evidently, even Oprah's magic touch has its limits. But there's another possible solution a little closer to home: China. The statistics speak for themselves. The Chinese are the fastest-growing tourism group in the world, with approximately 57.4 million people traveling overseas last year. Chinese tourists are now Australia's third largest market for inbound visitors, but most importantly, its fastest growing one. Within the last year, the number of visitors from the mainland has surged by 23%, contributing $3.26 billion to the economy. Australia's main tourism board, Tourism Australia, estimates that in a decade, Chinese tourists could triple their spending, pumping up to $9 billion per year into the economy. Countries all over the world have begun courting Chinese tourists in earnest, but Australia has been especially aggressive, committing $30 million over three years to its pursuit. As part of its efforts, Tourism Australia unveiled its China 2020 Strategic Plan in June aimed at nearly doubling the number of Chinese visitors to 860,000 over the next eight years. Forget dingos and Uluru  Australia isn't promoting this side of its culture to China. No, the country is pushing itself as a high-end destination for the super-rich, a place where they can buy luxury bags and clothes, stay in five-star hotels, eat in expensive restaurants and gamble in glitzy casinos. Andrew McEvoy, managing director of Tourism Australia, says Chinese tourists are attracted to Australia because it has the whole package. "It's an offering that is not just the gambling with the integrated resorts  it is gambling with great shopping, branded shopping and fantastic restaurants," he says. To make potential tourists aware of the luxe experience that awaits them, the tourism board has taken its marketing campaign to 13 cities in the mainland so far, with hopes of expanding to more than 30 cities by 2020. Tourism officials are also working with China's main airlines  China Southern and Air China  to increase the number of routes between the countries. Three years ago, there were few direct flights between China and Australia; by the end of 2011, there will be 77 direct flights each week. Four of the five airlines that offer direct routes are, in fact, Chinese airlines. Hotels and businesses are making visible changes to woo mainland visitors, too. Some hotel chains, for instance, have rearranged the furniture in its rooms across the country according to the principles of feng shui  assuring guests will have a harmonious stay. Accor Hotels and others are contemplating adding Chinese-language television channels to their rooms, as well. In addition, billionaire gambling tycoon James Packer has spent about $2 billion to upgrade his casinos in Melbourne and Perth in an attempt to lure Asians away from the booming casinos in Macau and Singapore. Every Chinese New Year, for instance, the Crown Casino in Melbourne holds a giant street festival in the city's Southbank neighborhood, with red lanterns hanging above the streets, food hawkers and Chinese dancers. It's just like home  only warmer. One look around Sydney or Melbourne and it's clear there are changes afoot. Signs in Chinese characters direct new arrivals where to go at Melbourne's Tullamarine Airport. Mandarin is heard on the streets of both cities as much as Spanish is heard in downtown Los Angeles. Tourist attractions like the Sydney Opera House now offer Mandarin-speaking guides or have Chinese signs posted to help mainland visitors find their way. These types of changes, however, are really only noticeable in Australia's main cities, where Chinese visitors spend the vast majority of their time. The Outback and the Great Barrier Reef may figure into an Australia trip eventually, but for the time being, most visitors are more interested in the thrills of discovering what the next retail shop has to offer. ''[Chinese tourists] want to return home from overseas trips with luxury goods as a symbol of their wealth," Sam Huang, a lecturer at the University of South Australia, pointed out recently in The Age. Of course, Australia is not the only country aware of China's rising spending power. Earlier this year, Taiwan removed its travel restrictions for mainland citizens, allowing them to come to the island as individual tourists, not with tour groups. One of the main reasons is money. Since mainland groups began arriving in Taiwan in 2008, they've pumped $3.8 billion into the Taiwanese economy. In Europe, where Chinese tourists also love to shop, luxury stores are hiring more Mandarin-speaking assistants. The French department store Printemps even has a special entrance for Chinese groups and provides Mandarin-speaking personal shoppers to cater to their needs. The number of Chinese tourists is expected to surge in the U.S., too: the U.S. Department of Commerce says it could see a 232% increase over the next six years. So forget Oprah, Australia. Next time see if Yao Ming is available. Erica Ho is a reporter at TIME. Find her on Twitter at @ericamho and Google+. You can also continue the discussion on TIME's Facebook page and on Twitter at @TIME. Read about Chinese tourists flocking to Taiwan. See photos of Chinese tourists as they visit North Korea.